Here’s an excellent post by Ron Miksha of badbeekeeping blog recognizing a bee scientist who went unrecognized in his own time. Thanks Ron for bringing many of us up to speed. You probably know that Karl von Frisch figured out how honey bees use their waggle-dance to communicate. He won the Nobel Prize for that and for other studies of bee behaviour. I think it was well-deserved and his experiments withstood criticism and independent confirmation. His discovery was intuitive and required hundreds of replicated experiments conducted over years of work in personally risky circumstances in Nazi Germany. But there is another scientist who came close to figuring out many of the things which brought von Frisch fame. The other scientist did his experiments in America, decades earlier. But he’s mostly unknown, largely forgotten. As many of my beekeeping friends might remember, I started December vowing to answer to, and identify myself as, “Lorenzo” to reservation takers, waitresses, and others. I am pleased to report that this has worked out well, with the exception of that overly serious State Trooper, so I am extending the practice another month. But Lorenzo Langstroth’s birthday month has come and gone and it is time to pick another beekeeper to honor. I encourage anyone so inclined to participate in this exercise of giving and responding to the name of a famous beekeeper for the month. Who knows when a question on the Certified Beekeepers test may become a simple remembrance due to your participation in this venture. So, with no further delay, during the month of January I will give and respond to the name, “Johann” in honor of Johann Dzierzon born January 16th, 1811. Apparently he also went by the name “Jan” so try each out from time to time to see how that flies. Try it out, it’s pronounced exactly as it’s spelled. Hey, I’m not sure it matters. Johann Dzierzon (16 January 1811 – 26 October 1906), was a pioneering apiarist who discovered the phenomenon of parthenogenesis in bees and designed the first successful movable-frame beehive. Dzierzon came from a Polish family in Silesia. Trained in theology, he combined his theoretical and practical work in apiculture with his duties as a Roman Catholic priest, before being compulsorily retired by the Church and eventually excommunicated. His discoveries and innovations made him world-famous in scientific and bee-keeping circles, and he has been described as the “father of modern apiculture”. Stack of Dzierzon hives. Illustration from Nordisk familjebok. In his apiary, Dzierzon studied the social life of honeybees and constructed several experimental beehives. In 1838 he devised the first practical movable-comb beehive, which allowed manipulation of individual honeycombs without destroying the structure of the hive. The correct distance between combs had been described as 1½ inches from the center of one top bar to the center of the next one. In 1848 Dzierzon introduced grooves into the hive’s side walls, replacing the strips of wood for moving top bars. The grooves were 8 × 8 mm—the exact average between ¼ and ⅜ inch, which is the range called the “bee space.” His design quickly gained popularity in Europe and North America. On the basis of the aforementioned measurements, August Adolph von Berlepsch (de) (May 1852) in Thuringia and L.L. Langstroth (October 1852) in the United States designed their frame-movable hives. In 1835 Dzierzon discovered that drones are produced from unfertilized eggs. Dzierzon’s paper, published in 1845, proposed that while queen bees and female worker bees were products of fertilization, drones were not, and that the diets of immature bees contributed to their subsequent roles. His results caused a revolution in bee crossbreeding and may have influenced Gregor Mendel‘s pioneering genetic research. The theory remained controversial until 1906, the year of Dzierzon’s death, when it was finally accepted by scientists at a conference in Marburg. In 1853 he acquired a colony of Italian bees to use as genetic markers in his research, and sent their progeny “to all the countries of Europe, and even to America.” In 1854 he discovered the mechanism of secretion of royal jelly and its role in the development of queen bees. With his discoveries and innovations, Dzierzon became world-famous in his lifetime. He received some hundred honorary memberships and awards from societies and organizations. In 1872 he received an honorary doctorate from the University of Munich. Other honors included the Austrian Order of Franz Joseph, the Bavarian Merit Order of St. Michael, the Hessian Ludwigsorden, the Russian Order of St. Anna, the Swedish Order of Vasa, the Prussian Order of the Crown, 4th Class, on his 90th birthday, and many more. He was an honorary member of the German Academy of Sciences Leopoldina. He also received an honorary diploma at Graz, presented by Archduke Johann of Austria. In 1903 Dzierzon was presented to Emperor Franz Joseph I of Austria. In 1904 he became an honorary member of the Schlesische Gesellschaft für vaterländische Kultur (“Silesian Society for Fatherland Culture”). In every direction, one has a broad and pleasant view, and I am pretty happy here, despite the isolation, as I am always close to my beloved bees — which, if one’s soul be receptive to the works of the Almighty and the wonders of nature, can transform even a desert into a paradise. From 1873 to 1902 Dzierzon was in contact with the Old Catholic Church, but in April 1905 he was reconciled with the Roman Catholic Church. He died in Lowkowitz on 26 October 1906 and is buried in the local graveyard. Johann Dzierzon is considered the father of modern apiology and apiculture. Most modern beehives derive from his design. Due to language barriers, Dzierzon was unaware of the achievements of his contemporary, L.L. Langstroth, the American “father of modern beekeeping”, though Langstroth had access to translations of Dzierzon’s works. Dzierzon’s manuscripts, letters, diplomas and original copies of his works were given to a Polish museum by his nephew, Franciszek Dzierżoń. In 1936 the Germans renamed Dzierzon’s birthplace, Lowkowitz, Bienendorf (“Bee Village”) in recognition of his work with apiculture. At the time, the Nazi government was changing many Slavic-derived place names such as Lowkowitz. After the region came under Polish control following World War II, the village would be renamed Łowkowice. Following the 1939 German invasion of Poland, many objects connected with Dzierzon were destroyed by German gendarmes on 1 December 1939 in an effort to conceal his Polish roots. The Nazis made strenuous efforts to enforce a view of Dzierżoń as a German. After World War II, when the Polish government assigned Polish names to most places in former German territories which had become part of Poland, the Silesian town of Reichenbach im Eulengebirge (traditionally known in Polish as Rychbach) was renamed Dzierżoniów in the man’s honor. AMHERST, MASSACHUSETTS—Emily Dickinson is known today as one of the greatest poets of the nineteenth century, but in her lifetime she may have been more renowned for her gardening. At her family estate, she helped to tend an orchard, a greenhouse, and an expanse of flower and vegetable gardens. The size of these gardens was dramatically decreased in the decades after Dickinson died in 1886, but now a team of archaeologists is searching for their remnants. Last summer, they uncovered portions of a pathway leading to nineteenth-century flower and vegetable beds. “If we can follow out the historic path to its end, then theoretically we would find the location of past gardens,” Kerry Lynch of Archaeological Services at the University of Massachusetts, Amherst, told the New York Times. If they do locate these gardens, the archaeologists hope to find seeds or other botanical evidence dating back to when Dickinson was alive. A. I. Root was born in a log house, December 9, 1830, about two miles north of the present manufacturing plant of The A. I. Root Co. He was a frail child, and his parents had little hopes of raising him to manhood, although some of the neighbors said his devoted mother would not let him die. As he grew older his taste for gardening and mechanics became apparent. Among his early hobbies were windmills, clocks, poultry, electricity, and chemistry —anything and everything in the mechanical line that would interest a boy who intensely loved machinery. Later on we find him experimenting in electricity and chemistry; and at 18 he is out on a lecturing-tour with a fully equipped apparatus of his own construction. We next find Mr. Root learning the jeweler’s trade, and it was not long before he decided to go into business for himself. He accordingly went to an old gentleman who loaned money, and asked him if he would let him have a certain amount of money for a limited time. This friend agreed to lend him the amount, but he urgently advised him to wait a little and earn the money by working for wages. This practical piece of advice, coming as it did at the very beginning of his career, was indeed a God-send, and. unlike most boys, he decided to accept it. Imbued with a love for his work, and having indomitable push, he soon earned enough to make a start in business, without borrowing a dollar. The business prospered till A. I. Root & Co. were the largest manufacturers of real coin-silver jewelry in the country. From $200 to $300 worth of coin was made weekly into rings and chains, and the firm employed something like 15 or 20 men and women. It was about this time, or in 1865, that a swarm of bees passed over his shop; but as this incident is given so fully in the introduction I omit it here. Not long after he became an A B C scholar himself in bees, he began to write for the American Bee Journal under the nom de plume of “Novice.” In these papers he recounted a few of his successes and many of his failures with bees. His frank confession of his mistakes, his style of writing, so simple, clear, and clean-cut, brought him into prominence at once. So many inquiries came in that he was finally induced to start a journal, entitled Gleanings in Bee Culture of this, now his business grew to such a size that the manufacturing plant alone covered five acres, and employed from 100 to 200 men —all this and more is told in the Introduction by the writer. As an inventor Mr. Root has occupied quite a unique field. He was the first to introduce the one pound-section honey-box, of which something like 50,000,000 are now made annually. He made the first practical ail-metal honey-extractor. This he very modestly styled the “Novice,” a machine of which thousands have been made and are still made. Among his other inventions may be named the Simplicity hive, the Novice honey-knife, several reversible frames, and the metal-cornered frame. The last named was the only invention he ever patented, and this he subsequently gave to the world long before the patent expired. In the line of horticultural tools he invented a number of useful little devices which he freely gave to the public. But the two inventions which he considers of the most value is one for storing up heat, like storing electricity in a storage battery, and another for disposing of sewage in rural districts. The first named is a system of storing up the heat from exhaust steam in Mother Earth in such a way that greenhouses and dwelling-houses can be heated, even after the engine has stopped at night, and for several days after. The other invention relates to a method of disposing of the sewage from indoor water-closets so that “Mother Earth,” as he calls it, will take it automatically and convert it into plant life, without the least danger to health or life, and that, too, for a period of years without attention from any one. Some of the secrets of his success in business may be briefly summed, up by saying that it was always his constant aim to send goods by return train, and to answer letters by return mail, although, of course, as the business continued to grow this became less and less practicable. He believed most emphatically in mixing business and religion—in conducting business on Christian principles; or to adopt a modern phrase, doing business “as Jesus would do it.” As might be expected, such a policy drew an immense clientage, for people far and wide believed in him. But how few, comparatively, in this busy world, go beyond the practice that honesty is the best policy! While A. 1. Root believed in this good rule he did not think it went far enough, and, accordingly, tried to adopt and live the Golden Rule. The severe strain of long hours of work, together with constantly failing health, compelled Mr. Root to throw some of the responsibilities of the increasing business on his sons and sons-in-law. This was between 1886 and 1890. At no definite time could it be said that there was a formal transfer of the management of the supply business and the management of the bee department of Gleanings to his children; but as time went on they gradually assumed the control, leaving him free to engage in gardening and other rural pursuits, and for the last ten years he has given almost no attention to bees, devoting nearly all his time to travel and to lighter rural Industries. He has written much on horticultural and agricultural subjects; indeed, it is probable that he has done more writing on these subjects than he ever did on bees. Note: He did not invent a section box for holding honey, but only a box just the right size to put 8 into a Langstroth frame. For the last twenty-five years he has been writing a series of lay sermons, touching particularly on the subject of mixing business and religion, work and wages, and, in general, the great problem of capital and labor. As an employer of labor he had here a large field for observation, and well has he made use of it. Perhaps no series of articles he ever wrote has elicited a more sympathetic response from his friends all over this wide world than these same talks; and through these he has been the means of bringing many a one into the fold of Christ. It has been a rather difficult matter to get a picture that was in any way satisfactory to the members of his family. Finally the writer, one day, with a Kodak, took a “time view” of him in his favorite place of resort, the greenhouse, among his “posies,” where he spends hours of his happiest moments. This view shows him just as he appears around home in his everyday work clothes. Ill health, or a sort of malaria that has been hanging about him for years, has forced him. during winter, to wear a fur cap and to keep his overcoat constantly on, indoors and outdoors, with the collar turned up. Karl Ritter von Frisch, (20 November 1886 – 12 June 1982) was an Austrian ethologist who received the Nobel Prize in Physiology or Medicine in 1973, along with Nikolaas Tinbergen and Konrad Lorenz. His work centered on investigations of the sensory perceptions of the honey bee and he was one of the first to translate the meaning of the waggle dance. His theory, described in his 1927 book Aus dem Leben der Bienen (translated into English as The Dancing Bees), was disputed by other scientists and greeted with skepticism at the time. Only much later was it shown to be an accurate theoretical analysis. The “waggle dance” is used to relay information about more distant food sources. In order to do this, the dancing bee moves forward a certain distance on the vertically hanging honeycomb in the hive, then traces a half circle to return to her starting point, whereupon the dance begins again. On the straight stretch, the bee “waggles” with her posterior. The direction of the straight stretch contains the information about the direction of the food source, the angle between the straight stretch and the vertical being precisely the angle which the direction of flight has to the position of the sun. The distance to the food source is relayed by the time taken to traverse the straight stretch, one second indicating a distance of approximately one kilometer (so the speed of the dance is inversely related to the actual distance). The other bees take in the information by keeping in close contact with the dancing bee and reconstructing its movements. They also receive information via their sense of smell about what is to be found at the food source (type of food, pollen, propolis, water) as well as its specific characteristics. The orientation functions so well that the bees can find a food source with the help of the waggle dance even if there are hindrances they must detour around like an intervening mountain. As to a sense of hearing, Frisch could not identify this perceptive faculty, but it was assumed that vibrations could be sensed and used for communication during the waggle dance. Confirmation was later provided by Dr. Jürgen Tautz, a bee researcher at Würzburg University’s Biocenter. In 1925, a Cornell professor of apiculture named Everett Franklin Phillips set out to create a major repository of literature on bees and beekeeping. He envisioned this library as an “accessible storehouse of our knowledge of bees and beekeeping.” By 1926, Phillips had persuaded over 223 people from twenty-nine states and twenty-six foreign countries to donate thousands of books and pamphlets, and the E.F. Phillips Beekeeping Collection at Cornell was born. Perhaps Phillips’ biggest coup was his ingenious plan for raising the money necessary for creating the library’s endowment: he convinced hundreds of New York state beekeepers to set aside one of their hives for the library. When a hive had raised $50 from honey sales, the beekeeper’s obligation was completed. Seventy-five years after beekeepers helped Phillips create one of the world’s finest collections of books and journals in beekeeping, a new generation of apiculturalists is leading efforts to digitize major parts of that collection. The idea for The Hive and the Honeybee emerged following the 2002 conference of the Eastern Apiculture Society, which was held on the Cornell University campus in Ithaca . In the years since then, individual beekeepers and beekeeping organizations from around the country have contributed funding to make some of the greatest works from American authors on beekeeping available via the Internet. With this generous support, collaborating staff from the University of Delaware, Mississippi State University, Mary Washington College, the Finger Lakes Beekeeping Association, and Mann Library at Cornell University launched The Hive and the Honeybee site in the spring of 2004, offering to the public the full text of ten rare books from the Phillips Collection, chosen by a team of scholars for their historical importance and usefulness to beekeepers today. Ongoing giving by American beekeepers has continued to expand the collection, and we are proud to announce that the Hive and the Honeybee today consists of the full text of over thirty books from the Phillips library as well as the first forty volumes of a landmark American publication, the American Bee Journal, an influential English language beekeeping journal read by scholars and practicing beekeepers and still being published today. We hope that eventually The Hive and the Honeybee will contain every major pre-1925 beekeeping work in the English language. The texts in this digital collection are fully searchable, and will also become part of the Core Historical Literature of Agriculture (CHLA). How fitting E.F. Phillips would find that beekeepers are again playing a central role in realizing a major new development for the Phillips collection. And how thrilled he and his original beekeeping collaborators would be to see the internet make a storehouse of beekeeping knowledge accessible to the world today. Mann Library would like to extend special thanks to the Eastern Apiculture Society and Mike Griggs for providing the initial inspiration and funding to create The Hive and the Honeybee online library. We are equally grateful to the many generous beekeeping associations, extension agencies, and individuals across the United States –from Florida to Maine and New York to Washington State –who have provided funding for the continued development of this digital collection. A downloadable bookmark showing the website address for The Hive and the Honeybee collection is available for desktop printing. To make a gift toward The Hive and the Honeybee please make your check payable to Cornell University and mail to Albert R. Mann Library, Cornell University , Ithaca , NY 14850 . To find out more about supporting this growing collection, please contact Eveline Ferretti, Albert R. Mann Library (tel. : (607) 254-4993; email: ef15@cornell.edu). Richard Taylor (November 5, 1919 – October 30, 2003), born in Charlotte, Michigan, was an American philosopher renowned for his dry wit and his contributions to metaphysics. He was also an internationally known beekeeper. Today is the anniversary of the birth of one of my beekeeper-heroes, Professor Richard Taylor. He was an early champion of the round comb honey system, a commercial beekeeper with just 300 hives, and he was a philosopher who wrote the book on metaphysics. Really, he wrote the book on metaphysics – for decades, his college text Metaphysics introduced first-year philosophy students to the most fundamental aspect of reality – the nature of cosmology and the existence of all things. Although his sport of philosophy was speculative, unprovable, and abstract to the highest degree, Richard Taylor was as common and down-to-earth as it’s possible to become. I will write about his philosophy and how it shaped his politics, but first, let’s celebrate his beekeeping. Today is John S. Harbison’s Birthday. 1857 – Made the first shipment of bees into California, Introducing commercial beekeeping into California, laying the foundation for the industry in that state. 1857 – Invented the section honey box. 1859 – Invented the Harbison, or California hive. 1873 – The firm of Clark & Harbison shipped the first car load of honey across the continent from California. There is no product of San Diego County that has done more to spread abroad her fame, than her honey. It has acquired a reputation in the markets of the world of the highest character. It is well known to the agriculturist that a section capable of producing such honey must possess superior advantages of soil and climate, and, as a result, the attention of a class of people has been directed hither who might have been influenced by the ordinary reports of the wonderful fertility of the country. Certainly, the man who was the pioneer in making known the fact that San Diego County was an apiarian paradise, is entitled to be classed as a public benefactor. It is concerning him that this sketch is written. John S. Harbison was born in Beaver County, Pennsylvania, September 29, 1826. He comes of a sterling American stock, and can trace his lineage back through several generations. His grandfather, John Harbison, and his grandmother, Massey Harbison, were among the first settlers of Western Pennsylvania, locating near the town of Freeport, twenty-eight miles above Pittsburgh, on the Alleghany River, where the first grist-mill in that region of country was built and operated by his grandfather. In those days that part of the country was subject to many Indian outbreaks, and the Harbisons experienced their full share of the trials and sufferings incident to a life on the frontier. His grandfather acquired fame as an Indian fighter, and participated in numerous engagements in repelling the frequent murderous raids made on the settlers by the treacherous tribes of Indians inhabiting the country from the Alleghany Mountains on the east, Lakes Erie and Michigan on the north and west, and the Ohio River on the south; arid as a volunteer soldier, took part in the several expeditions led by St. Clair and Wayne, which subsequently resulted in quelling all the Indian disturbances. Mr. Harbison’s grandfather on his mother’s side, William Curry, was a chief armorer in the Continental service, and was one of the memorable minute men of the Revolution, who were a picked body of men that could be relied upon under any circumstances and were detailed to execute the most hazardous and important undertakings. He fought in eight battles in that memorable struggle, and was with Washington when he crossed the Delaware on that stormy Christmas night and defeated the astonished Hessians encamped at Trenton. The youth and early manhood of John S. Harbison were passed upon a farm, but in 1854, having an attack of the gold fever, he made up his mind to come to California. In October of that year he sailed from New York on the steamship Northern Light, via Nicaraugua, connecting on this side with the Sierra Nevada, which had taken the place of the Yankee Blade, the latter having been wrecked just after leaving San Francisco. He arrived in San Francisco November 20, and immediately started for the mining camp known as Campo Seco, in Amador County. Here he found that gold mining was not all his imagination had pictured, he worked hard and received very meager returns. Considerably discouraged he left the mines in a few weeks, and went down to Sacramento. Glad to turn his hand to anything, he secured work in the Sutterville saw-mill, where he stayed several months. In the meantime Harbison h id made up his mind he would give-up the avocations for which he had little taste, and devote himself to something with which he was acquainted. He sent home to Pennsylvania for a general assortment of seeds, and a small invoice of fruit trees. He received the first consignment in February, and secured ground in the town of Sutterville, near Sacramento City, where he started the first nursery of fruit and shade trees in the Sacramento Valley. During the fall and winter of 1855, and again in the fall of 1856, he made large importations of the choicest fruit trees from the most celebrated nurseries in the East. From these importations was started that great series of orchards which line the banks of the Sacramento River and adjacent country. In May, 1857, he returned to his Eastern home, and began preparations for shipping a quantity of bees to California. He finally started from New York with sixty-seven colonies, and landed them safely Sacramento, after a journey of about four weeks. This venture was so popular that he went East again the next fill, and obtained a second supply of bees, which also were safely brought to this State. He continued the business of nurseryman and apiarist near Sacramento until February, 1874, when he removed with his family to San Diego, where he has resided ever since. Mr. H. has had some trouble with fruit-raisers, and the result was a conflagration of a whole apiary. Apiaries are usually burned by saturating each hive with kerosene, and then applying the torch; but in the case above, the hives were placed together and burned. In the fall of 1869, Mr. Harbison formed a partnership with Mr. R. G. Clark, for the purpose of introducing and keeping bees in San Diego County. They prepared a choice selection of one hundred and ten hives of bees from Mr. Harbison’s apiaries at Sacramento, and shipped them by the steamer Orizaba, which landed in San Diego on the morning of November 28, 1869. Mr. Clark remained in charge of the bees, making all the explorations for the most suitable ranges for the location of apiaries and production of honey. Other importations were made by the firm, and the partnership was continued for the period of four years, at the end of which time a division of the apiaries and effects was made. Mr. Clark soon after disposed of his apiaries, purchasing land in the El Cajon Valley, where he established the first raisin vineyard in the county. The great success attending the enterprise of Messrs. Clark and Harbison, and the world-wide fame of their San Diego County honey, very soon attracted the notice of bee-keepers and farmers of all parts of the States, and as a result, many were induced to come here, who took up public lands, established homes, and commenced the business of beekeeping and tilling of the soil. In December, 1857, Mr. Harbison invented the section honey box, an invention which has done more for the advancement of honey production than any other discovery in bee-keeping. For this he was granted a patent, January 4, 1859. At the California State Fair, held at Marysville, in September, 1858, Mr. Harbison exhibited the first section box honey. In 1873 the firm of Clark & Harbison shipped the first car load of honey across the continent from California. Mr. Harbison was awarded a medal and diploma for his exhibit of San Diego County honey at the Centennial Exposition at Philadelphia, in 1876. Besides his labors as a practical horticulturist, a farmer and apiarist, Mr. Harbison has found time to contribute occasionally to current literature on those subjects with which he is familiar, and is the author of a book of four hundred and forty pages, entitled, “Bee Keepers’ Directory,” it treats of bee culture in all its departments and is a recognized authority on the subject of which it treats. Although it was published in 1861, it is still considered the most practical work of the kind ever issued. Mr. Harbison was married to Mary J. White, of New Castle, Pennsylvania, in 1865. The result of the union is one son, who died in infancy, and two daughters, both 6f whom are living. He came relatively late to beekeeping but shared a nicely written book titled, The Queen Must Die, and other affairs of bee and men. Not quite bee biology but a wonderful presentation of bee behavior and philosophical thoughts on same. Albert J. Cook (1842-1916) was a 19th century educator and writer who influenced an entire generation of American beekeepers. He served as an instructor at Michigan Agricultural College (Michigan Agricultural University) in 1866 (Michigan State University later) where he offered one of the first collegiate courses in beekeeping culture. Cook published the first textbook on American beekeeping, The Manual of the Apiary, in 1876 based upon his lecture series. The book was an instant success. Beginning as a mere brochure, this textbook expanded through ten editions in less than a decade, growing with each edition. Albert J. Cook, professor of zoology and entomology, established the insect collection at Michigan Agricultural College (Agricultural University of Michigan) in 1867. By 1878, the collection consisted of nearly 1,200 local specimens collected primarily used for demonstration classrooms, for comparison, and to aid in species identification for farmers Michigan. Manual of the apiary. Chicago: Newman & Son (1880). Wintering bees. Lansing: Agricultural College of Michigan (1885). Report of apicultural experiments in 1891. (1892). The Bee-Keeper’s Guide; or Manual of the Apiary pp. 543. (17th ed.) Chicago: Newman & Son (1902). Happy Birthday George W. Imirie, Jr.
George Wady Imirie Jr., 84, a master beekeeper who tirelessly promoted the value of bees and beehives, died of congestive heart failure Sept. 6 at the Casey House in Rockville. As a beekeeper since 1933, Mr. Imirie knew enough about the stinging insects to brave the swarms at his Rockville home without the usual head-to-toe beekeeping garb. Far more than stings, Mr. Imirie worried about the decline in bee colonies over the past several decades, infestation of the wild bee population by mites, and the level of knowledge and skill of those who keep apiaries. In addition, Mr. Imirie and his sons thrilled Montgomery County Fair visitors and schoolchildren with demonstrations with a live hive of honeybees. A Bethesda native born to a family that has been in the area for 298 years, Mr. Imirie started tending hives at age 9, following in the footsteps of his father and grandfather. He dropped the hobby when he went to the University of Michigan for his undergraduate degree. He was studying for a graduate degree in atomic engineering when World War II broke out. He was briefly in the Army, then joined the Manhattan Project in Oak Ridge, Tenn., and Los Alamos, N.M., working on the atomic bombs that were dropped on Hiroshima and Nagasaki. After the war, he studied engineering at Washington University in St. Louis and American University, one of his sons said. Mr. Imirie returned to Bethesda and helped run the family auto parts business for most of his working life until it was sold 18 years ago. Mr. Imirie resumed beekeeping on his six-acre property in Rockville. He set up the hives in a square around a gnarly old apple tree. A hedge trimmed to a height just taller than Mr. Imirie surrounded the yard so that when bees emerged from the hives in search of nectar they would fly high enough to clear the bushes and avoid bystanders. He founded the beekeepers association in the 1980s and for many years ran it almost single-handedly. After five strokes in 1990, Mr. Imirie began using a scooter. Throat cancer further slowed him in the late 1990s. When Maryland agreed to produce auto license plates with a beekeeping insignia, Mr. Imirie was given the prototype, BEE 001, which he affixed to his scooter. The association named its annual award for education after him. Walt Wright was born and raised in Burtonsville, MD, then a barefoot country boy area, and now suburbia of a sprawling Washington, DC. He enlisted in the Air Force to get electronics training, and served as a radar repairman. After service time he joined General Electric in maintaining overseas sites of the Security Service (spell that SPY). Still with GE, in 1960 he relocated to Huntsville, Ala./Redstone Arsenal to make his contribution on the nation’s quest to put a man on the moon. Development of the propulsive stages of the Saturn V moon rocket was accomplished by NASA on Redstone Arsenal. His responsibility on that program was electronic compatibility of subsystems within stages and compatibility between propulsive stages and the electronics of the instrument ring. No interaction (interference/noise) was permitted between systems on the man-rated launch vehicle. For the Shuttle program, an added responsibility was systems engineer for on-board Range Safety components. The Air Force has autonomous authority to destroy any launch from the Cape area that poses a threat to populated areas of eastern Florida. Astronauts on board is no exception. If the launch strays from the predicted trajectory, the Air Force can destroy the vehicle by radio command. On-board equipment to implement destruct includes the command receiving and processing electronics and pyrotechnics to disperse propellants. Walt is aware that the above work history provides very weak credentials to be considered as a honey bee “expert.” He took up beekeeping in his late fifties to supplement retirement income. Confident in his trouble shooting skills, he accepted the challenge “very early” to get to the bottom of the swarming problem. He credits observation skills, sharpened by years of electronics trouble-shooting, for solving the riddle. He was surprised that it was as easy as it was. When his hypothesis was in place in three years, he thought at first it must be in error. Surely, thousands of beekeepers, looking into millions of hives, could not possibly have missed the obvious. His conclusion: beekeepers see, but do not observe, or ask themselves why the bees do what they do. Honey bees are motivated by survival of the colony. Survival of the existing colony is priority one. In the spring, priority two is the generation of the reproductive swarm. Not even that much is described in the popular literature. Walt concentrated his investigation of swarming in terms of colony activities that support those survival objectives. His findings are a radical departure from literature conventional wisdom. As an example, he claims that all the elements of “congestion”, such as bee crowding and nectar in the brood nest, are deliberate steps to implementing the reproductive swarm process, and not the other way around. The literature has congestion as the “cause” and that’s backwards. Getting his observations published has been slow moving. Editors of the magazines have an obligation to their subscribers to weed out the chaff from crackpots. Natural skepticism creates mostly rejections of submitted articles. For the year 06 he resorted to writing articles on general beekeeping techniques to build a base of credibility. He looks forward to presenting his observations through Beesource. It should not be necessary via this medium to appease editors or their advisors. As a start in telling it like it is, he announces point blank: The mystery of reproductive swarming has been solved. Note: Title with an asterisk (*) in front are pertinent to Nectar Management. Dyce was best known for his process for controlling the crystallization and fermentation of honey leading to the popular creamed honey. His process is used throughout the world in all major honey-producing countries. Professor Emeritus E. J. Dyce served as assistant professor, associate professor, and professor of apiculture in the University’s Department of Entomology for twenty-three years. He had retired on December 31, 1965. A native of Ontario, Dyce served as demonstrator, lecturer, and professor of apiculture at the Ontario Agricultural College in Guelph, now Guelph University, from 1924 to 1940. He was the first manager of the Finger Lakes Honey Producers Cooperative in Groton, New York, between 1940 and 1942; in that position he worked to develop a wide market for New York State honey. Dr. Dyce was born and raised in Meaford, Ontario. He obtained his B.S.A. from Ontario Agricultural College in 1923. He earned his M.S. degree at McGill University where he was a Macdonald scholar. He obtained his Ph.D. degree at Cornell under the direction of Professor E.F. Phillips. Dr. E. J. Dyce, then professor of Apiculture at Guelph University and later Professor of Apiculture at Cornell University, developed the first practical process for making a granulated honey in 1928. Dyce later patented the process and in Canada gave the patent rights to the Province of Ontario. In the United States the rights were given to Cornell University. Much of the money earned in the United States was invested and the income is still used to support research on bees and honey at Cornell. The patent has now expired and anyone may manufacture and market the product. When Dyce began his studies there was little known about honey granulation and fermentation. He was aware that all natural honeys contain yeast. When the moisture content of the honey is somewhat above 19 percent, these yeast cells grow, producing carbon dioxide and alcohol. The yeasts found in honey are not the same as those used to make alcoholic beverages or bread but belong to the genus zygosaccharomyces. However, carbon dioxide may be produced in such quantity in fermenting honey as to burst the drums or containers in which the honey is packed. The foul odor produced by fermentation makes the honey unmarketable. If it is not damaged too badly it may be used as bee food. When honey granulates a small amount of the water in honey is taken into the sugar crystals. However, the quantity of water so contained is not proportional to the amount of water in the honey. Thus one may have a jar, drum or container of partially crystallized honey in which the liquid fraction has a moisture content higher than that of the original honey. When this occurs the honey may ferment. Dyce recognized that if he was to control the granulation of honey he must first pasteurize the product. Any seed crystals he added must also be made from honey, which had been pasteurized. Dyce found that the optimum temperature for honey granulation is 57â€™ F. There has been much conflict about this question in the literature. Many people were of the opinion that a fluctuating temperature speeded up granulation; Dyce showed this was not true. Most granulated honeys will have a firm texture six to 14 days after the introduction of seed crystals if held at the proper temperature. In commercial practice rooms used for holding honey the process of crystallizing are held within 10â€™F. of the optimum temperature. Pasteurization of honey destroys the nuclei on which crystals might grow. Dyce found he could introduce previously granulated honey, that which had been ground and the crystals broken, into honey to be crystallized. These crystals are called starters. When five percent of a ground, finely granulated honey was introduced into newly pasteurized honey there is a sufficient quantity of seed to produce a high quality, finely crystallized honey. In commercial practice most firms use eight to ten percent starter; under ideal conditions less may be used. An important factor is that the seed crystals must not be warmed too long and thereby caused to melt partially. Dark, strong flavored honeys have a lighter color and milder flavor when made into a finely granulated honey; this fact has led some packers to use less than desirable honey in making granulated honey. Honeys used to make granulated honey should be of table quality. The optimum moisture content is 17 Â½ to 18 percent; in the northern states 18 percent in winter and 17 Â½ percent in summer; in the southern states 17 Â½ percent is used throughout the year. The moisture content of a crystallized honey has a great effect on its hardness and therefore its spreadability. Honeys which have a higher or lower moisture content will be too hard or too soft and will not spread properly when spread at room temperature. The first step then is the selection and blending of honeys of proper color and moisture contents. Honeys to be processed by the Dyce process need not be filtered. In fact, filtering removes certain of the natural elements present in honey, especially pollen. The honey should be heated to about 125â€™F at which temperature it should be carefully strained. Dyce recommended the honey next be rapidly heated to 150â€™F and then cooled rapidly. This temperature is sufficiently high to kill the yeast present. Prof. G.F. Townsend of Guelph University showed that yeasts in honey were killed if it was held at 160â€™F for one minute or 140â€™F for 30 minutes or some equivalent combination of time and temperature between these two extremes. In commercial practice e there is time involved between heating and cooling the honey, which also has an effect on yeasts. If the honey in a bulk tank is heated to 150â€™F and then cooled, even under optimum conditions, it will have heated enough to kill any yeast cells present. For a starter one uses granulated honey, which has been previously made by the Dyce process. It is not satisfactory to take previously granulated honey from the grocerâ€™s shelf to be used as seed since the high Temperature at which this honey is held in a store will have started to melt the crystal nuclei present. One method of obtaining a yeast-free, finely granulated honey to use as a starter is to grind with a mortar and pestle a small amount of coarsely crystallized honey that had been heated (pasteurized) previously. The honey must be ground very finely and preferably at a temperature in the vicinity of 57â€™F as the crystals may melt at higher temperatures. The honey into which the crystal nuclei are introduced must also be cooled before the starter is added. Most of the grinders used for starter for Dyce crystallized honey are homemade or modifications of meat or food grinders on the market. Honey which is in the process of granulating and which is held at lower than room temperatures is viscous. Often a number of air bubbles are incorporated into it in the process of cooling and/or adding the seed. These small air bubbles may rise to the surface of the product and give it a white frothy appearance. This white froth may be avoided by allowing the honey to settle a few hours before it is packed, or packing and cooling the honey rapidly so the air bubbles are incorporated into the final product. The air has no objectionable effect on the flavor. Granulated honey in glass may pull away from the glass. The honey may assume a white froth-like appearance between the honey and the inside of the glass. Customers usually do not realize what has happened and may think the honey has spoiled or become moldy. (Mold cannot grow on or in honey.) It is for this reason that granulated honey is usually packed in tubs or glass jars with labels that wrap completely around the container. The seed crystals are usually added to the cooling honey when the temperature has reached about 75â€™F. It is very difficult to force honey to flow at lower temperatures. This temperature is higher than desired but if it is not held too long little damage is done. However, when cases of newly packed, crystallized honey are placed on pallets or trucks the cases must be carefully spaced so that air can flow between and around the cases. If this is not done the stack of newly packed jars will retain heat. This heat could have an adverse effect on seed crystals and cause them to be less effective as crystal nuclei. Properly made granulated honey has a long shelf life, longer than most liquid honey. Honey packers have observed that they may make and hold granulated honey for long periods of time, much longer than they would have stored packed, liquid honey. Granulated honey made and held under controlled conditions retains its fine texture, color, appearance and taste. There is probably a wider market for honey in this form than is now being exploited. Charles Martin Simon was born on July 8, 1941, at 6 A.M., in Newark, N.J. He graduated from Montclair Academy, a private, pseudo-military high school famous for it’s state-of-the-art dress code and discipline, in 1959, and went on to Rutgers, the State University of New Jersey, where he majored in Agriculture and English Literature. He was always a writer, having started his first novel in 1948, at the age of seven, and always a nature boy, therefore the split major. But after two years at Rutgers, he realized the agriculture he was being taught was not the agriculture he wanted to learn, and it was only going to get worse. He’d had enough of castrating sheep, calculating chemical fertilizer specifications, and murdering chickens. His English literature studies weren’t much more promising. The high point came when the editor-in-chief of the College Literary Magazine, who, although never having learned to write himself, went on to become the has-been of an illustrious career as the Clinton Administration’s Poet Laureate, recognized Simon’s writing and asked him to take over the magazine, which offer Simon graciously declined. Simon dropped out and drifted for a few years and then went to California and became part of the organic farming movement, as a partner in a 21-acre piece. Believing strongly in non-mechanized farming, he worked the farm completely by hand from 1967 until 1977. And that was where his involvement with bees began in earnest in 1967. The 21 acres cost $5,000 originally, but when the partners were offered $350,000.00, they just couldn’t resist. Simon voted against the sale, arguing that the ten years put into the land was worth more than any amount of money. He was outvoted, the land was not divisible, and he lost the farm. But he did not lose the bees. He was able to keep them on various pieces of property and continue with bee culture, since it is not dependent on stable locations as are horses, chickens, goats, gardens, and orchards. In 1990, he invented and began marketing world-wide the SuperUnfoundation bee frame. This was well-received and selling well when the price of wood doubled and then tripled. It suddenly cost more for the raw materials than he could get selling the finished frames, and he was out of business. Never one to accept things “as they are” and being much more interested in the health of the bees than in their produce, he is developing an apiculture system to allow the bees to actualize their true potential vitality and really solve the varroa and many other bee problems. Simon had no hobbies, having followed Henry David Thoreau’s advice to make one’s vocation and avocation one. He operated a one-man bee and wasp removal service and cared for bees in several locations. He also helped people overcome disease and get healthy and stay healthy. And he wrote, with twelve books in print. He self-published, executed every part of the book process himself: conceived, wrote, edit, designed, formatted, printed, cut, bound each volume by hand. His books are in stock in a few bookstores and available from all bookstores via the ISBN system, but he sold mostly direct to the public at CharlesMartinSimon.com. Gentle Bee! bright example to mankind of industry, economy, concord, and obedience! What triumphs, what wonders, dost thou not achieve! It shall be our delightful task to talk of thee, to write of thee; and if we talk not, and write not, pleasantly, then, indeed, the fault is in-ourselves, and not in thee. Sweet is the sound of thy mourning hum, attuned to music, when thou revellest on some gay bank of purple heather, visiting bell after bell in quest of their ambrosial essence, heaven-distilled! Sweet is the air around thee, air impregnated with the breath of flowers! Sweet is the joyous concert of feathered choristers above and about thee! Sweet is the memory of those few happy days when we have drunk freely of scenes like these, and basked in the early sunshine on some fragrant bed of thyme, “ dazzled and drunk with beauty ”-—the beauty of nature. ~The entomological magazine, 1835, Volume 2, Page 270. By Bevan, Edward, M.D. The Biography of Edward Bevan. Bevan, Edward, M.D. (1770-1860), physician and an eminent apiarian, was born, in London on 8 July 1770. Being left fatherless in early infancy, he was received into the house of his maternal grandfather, Mr. Powle, of Hereford, and at the age of eight was placed at the grammar school, Woottonunder- Edge, where he remained for four years. He was afterwards removed to the college school at Hereford, and it having been determined that he should adopt medicine as a profession, he was apprenticed to a surgeon in that town. He then proceeded to London, was entered as a student at St. Bartholomew’ s Hospital, and during three sessions of attendance on the lectures of his instructors Abernethy, Latham, and Austin, he acquired the honourable appellation of ‘the indefatigable.’ His degree of M.D. was obtained from the university of St. Andrew’s in 1818. He commenced practice at Mort-lake as assistant to Dr. John Clarke. After five years so spent he settled on his own account first at Stoke-upon-Trent, and then at Congleton. There he married the second daughter of Mr. Cartwright, an apothecary, one of the last of the ‘ bishops ‘ of a sect called the primitive Christian church. After twelve years’ residence in Cheshire, his health not bearing the fatigue of a country business, Bevan again returned to Mortlake, and practised there for two years, but with a like result. He thereupon retired to a small estate at Bridstow, near Ross, in Herefordshire, where he devoted himself to the development of an apiary which he found already established on his newly acquired property. Previous to this he had, in 1822, assisted his friend Mr. Samuel Parkes in the preparation of the third and revised edition of the latter’s ‘ Rudiments of Chemistry.’ The first edition of his book on bees was issued in 1827, with the title, `The Honey- Bee : its Natural History, Physiology, and Management.’ This treatise at once established the author’s reputation as a scientific apiarian, and was read wherever the bee is regarded as an object of interest. The second edition, published in 1838, is dedicated to her Majesty. In it the author has included much new and valuable matter. A third edition, by W. A. Munn, appeared in 1870. Bevan also wrote a paper on the ‘ Honey-Bee Communities ‘ in the first volume of the ‘ Magazine of Zoology and Botany,’ and published a few copies of ‘ Hints on the History and Management of the Honey-Bee,’ which had formed the substance of two lectures read before the Hereford Literary Institution in the winter of 1850-51. He had from 1849 fixed his residence at Hereford, where he died on 31 Jan. 1860, when within a few months of completing his ninetieth year As a public man Bevan was shy and retiring, but was much beloved in the circle of his private acquaintances. It is recorded as a proof of the esteem in which he was held, that on the occasion of a great flood in the Wye, in February 1802, washing away all the doctor’s beehives, a public subscription was raised, and a new apiary presented to him, of which, as a very pleasing substitute for what he had playfully called his ‘ Virgilian Temple,’ the venerable apiarian was justly proud. Bevan was one of the founders of the Entomological Society in 1833. Frank Benton – born July 5, 1852, in Coldwater, Mich. His education was obtained in the public school of that city and in the Michigan Agricultural College. He taught for a few years in rural schools and in the University of East Tennessee. but soon abandoned this work for beekeeping. For many years Frank Benton was prominently identified with the beekeeping industry of America. He spent 12 years abroad, living in Cypress, Beirut, Syria, Germany, and Austria, investigating the different races of bees in those foreign countries, and exported thousands of queens from numerous subspecies shipping them to all parts of the world. He was the inventor of the Benton cage for shipping queen bees. The cage is used almost exclusively in the modern queen shipping industry, allowing for convenient transport of bees over long distances. In 1890, he took a position in the United States Department Agriculture, as the first Apiculture Specialist. During his administration of the Department of Apiculture at Washington he occupied very much of his time in the investigation of the various kinds of bees, and traveled much abroad in this work. He was especially interested in the big bee of India, the Apis dorsata, and tried to acclimate them in this country. His administration of the department was a stormy one, but today no one questions the right purpose of his great enthusiasm, and his devotion to the cause and advancement of beekeeping. His contributions to the beekeeping industry in America are many, if relatively unknown. Besides being the inventor of the Benton queen shipping cage, he exported thousands of queens from numerous subspecies, adding to the genetic diversity of A. Mellifera in the New World. Ironically, many of the bees he imported were not popular with beekeepers, who stopped managing them in favor of gentler races. In 1899, while with the Department of Agriculture, Benton wrote The Honey Bee: A manual For Apicultural Instruction, a 118 page guide for new beekeepers. He wrote many articles on bees for different publications and was the inventor of the mailing cage known as the “Benton cage.” He was a linguist, speaking fluently several languages. Searching for the big bees of India for Apis Dorsata, be contracted jungle fever. which was the beginning of years of ill-health for him and caused his retirement from active labor, but not from continued interest in apiculture. He sought some betterment of his condition in the warm climate of Florida. Death occurred at Fort Myers, February 28. Benton remains one of the lesser known figures in beekeeping, largely because he lived during a time when critical labor-saving and profit-making making devices, such as the moveable frame hive and the centrifugal honey extractor, were invented, and the Italian honey bee rose to prominence in American beekeeping; by comparison, his contributions seem modest Upon his death in February 1919, the American Bee Journal published an obituary and a short travelogue about Benton (Anonymous 1919); but, apart from a mention of his importations in Pellett’s History of American Beekeeping, little else was written of his work. Early in 1880, Frank Benton. went abroad, where eleven eventful years were spent in travel and study, and in investigating the honeybees of Europe, Asia and Africa. Apiaries were established on the Island of Cyprus and in the Holy Lands at Beirut. Syria. In the winter of 1880-81 Ceylon, India. Farther India and Java were visited and extensive collections and studies were made of the native bees of those regions. It was on this expedition that the “jungle fever” was contracted, which ultimately claimed its own. but only after many years of active service had intervened. The winter of 1882-3 found Dr. Benton a student at the University of Athens, and the years 1884-86 were spent at the University of Munich, where he all but completed his work for the doctorate. He was granted the Master of Science degree by the Michigan Agricultural College in 1885 in view of his studies abroad; and some years later the degree of Se. D. was conferred upon him by the Oriental University of America for similar studies. During the years spent in Munich several trips were made to Cyprus and Syria, and on one occasion Tunis and the African coast were visited and the bees of these regions studied. Italy was visited by the way as was also the little province of Carniola, in southern Austria, with the result that the four years from 1886-90 were spent in the fastnesses of the Carnic Alps in investigating, breeding and giving to the world the docile bees native to these mountains. In 1890 Dr. Benton was commissioned by Dr. C. V. Riley, the United States Entomologist at Washington, to proceed to the Orient for the purpose of carrying on further investigations of the giant bees of India, and to study and import the Blastophaga wasp from Smyrna in the interest of establishing the Smyrna fig industry in California. Unfortunately, this commission passed Dr. Benton on the high seas, as he had already sailed from Hamburg for New York in December of 1890, after an absence from his native land of eleven years. On ‘his arrival in America Dr. Benton was offered a chair in modern languages at Cornell University, and at the same time came an offer from the United States Government to go into scientific work at Washington. It was not an easy matter to decide, especially for one so rarely gifted in both fields of endeavor. But at the parting of the ways Dr. Benton, at the age of 39 years elected to go into scientific work, thereafter ‘becoming only indirectly identified with academic life as an occasional lecturer. He proceeded to Washington in July, 1891, ‘the proposed trip of exploration abroad being held in abeyance for the time being. and fourteen years intervened before this second journey was finally undertaken. It was not until June, 1905, that Dr. Benton finally undertook his second tour of apicultural and botanical exploration which became a world embracing expedition, and everywhere he was welcomed and given the highest attention and every consideration by both scientific workers and members of apicultural societies and of the apicultural press. One leading periodical in summarizing his work closed with the statement, “Happy America that can speed such a man on such a journey!”—an index of his appreciative reception abroad. The overland route through the Balkans to Constantinople was followed and from thence the Caucasus was visited, where, in spite of the Russian revolution of that year, much data of value was collected, and representatives of the Caucasian races of bees imported. During the height of the revolution the Bishop of Armenia extended to Dr. Benton the hospitality of his monastery at Erivan, where Dr. Benton took refuge for several weeks until able to proceed to Baku on the Caspian Sea, from which point the long journey inland through Asia was started. Turkestan and Bokhara were visited, from where was imported the Turkestan melon, now becoming extensively grown in this country as a table delicacy. Turning southward, Dr. Benton organized a caravan, traveling a thousand miles through Persia, reaching Teheran early in January, 1906, and India the fore part of March. During the next seven months every part of India was visited, from Quetta in the northwest to the jungles of Assam, front the plains of Jubbulpore to the Himalayas of Simla and Darjeeling. and extensive studies made of the native honeybees which were captured and kept under observation in experimental hives. The guest of His Highness, the Maharaja of Kashmir, Dr. Benton had placed at his disposal a herd of elephants and retainers which greatly facilitated the work of exploration that he was engaged in. Finally, in September, the Philippines were reached and several months were spent in a long tour of this thousand-mile archipelago. At Zamboango, in Mindanao, Dr. Benton was very ill with fever contracted in the jungles of Assam, but despite these difficulties, he was able to rally and continue his work of investigation. The homeward journey was made by way of the Chinese coast. and some time was spent in Japan, Dr. Benton reaching America early in 1907, after an absence of nearly two years, with his long-planned journey an accomplished fact. Roger Alfred Morse was born July 5, 1927. Roger A. Morse, who turned a childhood interest in beekeeping into an encyclopedic knowledge that made him one of the best-known apiculturists in the world, died May 12, 2000 at his home in Ithaca, N.Y. He was 72. Dr. Morse, an entomology professor at Cornell University for more than 40 years, was a quiet man of fluid motion — traits that served him well in a field that often put him in intimate proximity with thousands of bees. That is not to say that he did not get his share of stings. Four days before his death, he visited his laboratory and returned home with what proved to be a final trophy. ”He died with a little bee sting on his eye,” said his daughter Susan. A prolific author, Dr. Morse straddled the worlds of professional beekeepers and amateur ones, whose numbers in the United States are put around 200,000. Although much of his renown came from such popular books as ”The Complete Guide to Beekeeping” (E. P. Dutton), which for many beekeepers is almost as much a necessity as the hives themselves, Dr. Morse’s knowledge was widely sought by commercial beekeepers around the world. These beekeepers not only produce honey but play a vital role in pollinating vast swaths of cultivated land: in the United States alone, about $10 billion worth of crops each year are pollinated entirely or partly by bees. Dr. Morse traveled the world, often for the United States Department of Agriculture, teaching local beekeepers from Africa to South America how to improve their craft. ”There wasn’t any subject that you could bring up in the area of bees and beekeeping that he couldn’t discuss with you,” said Philip A. Mason, a corporate lawyer in Boston who worked as Dr. Morse’s last graduate student while he was on a sabbatical from the business world. Roger Alfred Morse was born July 5, 1927, in Saugerties, N.Y. His father, Grant, a superintendent of schools, kept bees as a hobby and instilled the interest in his son. Roger Morse began tending his own hives when he was about 10, his family said. After serving in the Army in Europe from 1944 to 1947, he enrolled at Cornell, where he earned a bachelor’s degree and, in 1955, his doctorate. He joined the faculty about two years later, and from 1986 was chairman of the entomology department. Over the years, he also taught in Helsinki, Brazil and the Philippines. When he was not thinking about how to improve the general practice of beekeeping, he was looking at the intricate network of bee societies. Scientists have long been fascinated by the complexity of the hives and their elaborate division of labor, in which roles are assigned ranging from queen to, in essence, undertaker. ”If you want to understand sociology in this world, there is nothing like the honeybees,” Dr. Morse said in a 1991 interview. He spent much time studying the incursion of the Africanized bee, a cross-breed known popularly, if fancifully, as the killer bee, which escaped from a laboratory in Brazil in the 1950’s. The bees’ reputation for aggressiveness made for many scare stories as they made their way north, eventually arriving in this country in the early 1990’s. Dr. Morse, though, was more sanguine than many. He suggested once that after the bees began mating with local species, they might end up strengthening the domestic bee population. ”I’m not saying these bees are kittens, but they can be worked with,” he said in an interview in Popular Science magazine. He was more worried about two forms of mite — tracheal and varroa — that in recent years have been ravaging wild bee populations, forcing commercial beekeepers to monitor their hives vigilantly. Dr. Morse estimated that in the mid-1990’s, as many as 45 billion bees from 750,000 hives had been killed by the mites. In addition to his daughter Susan, of Ithaca, Dr. Morse is survived by his wife, the former Mary Louise Smith, whom he married in 1951; another daughter, Mary Ann, of New York; a son, Joseph, an entomologist at the University of California at Riverside; a sister, Jean Kallop of Voorheesville, N.Y.; and a brother, Stanley, of Millbrook, N.Y.
At Cornell, in addition to his other teaching duties, Dr. Morse taught the introductory beekeeping course and, as recently as last fall, a laboratory course on practical beekeeping. In the early 1960’s, an article described how he had figured out a way to lure swarms of bees to follow him wherever he walked. The trick was to carry filter paper saturated with the ground-up queen bee mandible glands. Dr. Morse also maintained his own hives at home, and he did so using the same sort of utilitarian approach he urged on his readers. In ”A Year in the Beeyard” (Charles Scribner’s Sons), he wrote: ”My apiaries are not picturesque; my combs are not uniformly free of drone comb; and not all of my equipment is well painted. He often gave the honey away to acquaintances, which endeared him to them. But not so much, perhaps, as when he was a graduate student at Cornell and writing his thesis on mead, the wine made from honey. His fellow students often benefited from the fruits of his research. ”I was very popular at school,” Mr. Mason recalled Dr. Morse saying. Johannes Mehring first made comb foundation in 1857. Straight combs were assured when Johannes Mehring, a carpenter from Germany designed wax foundation with octagonal indentations (5 per inch) for use in Langstroth’s frames. When Langstroth invented the loose-hanging frame and the top-opening hive, he paved the way for a substantial industry in the production of honey, but two other important inventions were necessary before rapid progress was possible. Until the invention of the extractor and comb foundation, beekeeping was far from easy. Because of the difficulties mentioned above, Langstroth spent much time in the development of a comb guide which would insure straight combs. The result was a triangular guide at top of frames to take the place of the guide combs. This sharp edge below the top bar provided an attractive place for the bees to start the combs and proved of some help. Langstroth applied for a patent, feeling that it was essential to the success of his hives. Much delay ensued and similar applications from others finally resulted in the refusal of the commissioner to issue a patent to anyone. Charles Dadant later told the story in the bee magazines of the effort which he made to secure worker comb during the early years of his experience, before foundation came into use. He sent his son about the country in early spring to buy the combs from all colonies which had died during the winter. Every piece was carefully saved and many small bits pieced together to the best advantage. Later when Langstroth discovered that the triangular guide had been anticipated by John Hunter in 1793, and long before that by Della Rocca, he expressed great satisfaction because no patent had been issued to him. He had incurred many vexations, loss of time, and much expense, but he regarded these as trifling in comparison to the pain which comes to an honest inventor “when apparent success gives way to bitter mortification of finding the patent absolutely worthless. ” Hunter had written that, by the use of a salient angle, bees could be induced to build their combs in any direction desired and Della Rocca had described the triangular device for the same purpose. Later a patent was issued to another claimant and Langstroth was sued for infringement. By this time, having the necessary information at hand, it was easy to defend the suit, but not without some annoyance and expense. To get a hive filled with good, straight combs required close attention on the part of the beekeeper. It was a common practice to place an empty frame between two well-built combs. In this way, the bees would find it quite natural to build the new one in the desired manner. The invention of foundation must be credited to a German, Johannes Mehring, who first succeeded in producing a crude product in 1857. 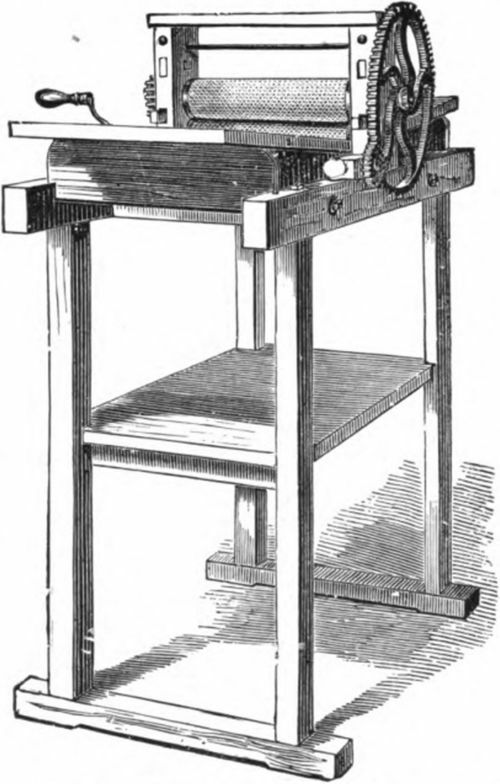 He invented a press to impress wax wafers with the indentations common to the bottoms of the cells. There were no projections for ceil walls, and the bees consequently were less inclined to build only worker comb. Much drone comb was built on such foundation but it did provide a means of securing straight combs. A Swiss apiarist. Peter Jacob, improved the Mehring press, and some of his foundation was imported to America in 1865. Samuel Wagner appears to have made some attempts to manufacture foundation, adding shallow sidewalls and, in 1861, secured a patent on the manufacture of artificial honey comb foundation by whatever process made. He was not successful and later dropped the matter. In the meantime his patent probably kept others from experimenting and probably delayed the perfection of the process. In 1876 Gleanings published directions by F. Cheshire for making a plaster of Paris mould on which foundation could be made. In the same issue, the editor comments at length on this and on the foundation made in this country by a man named Long and by F. Weiss, a German. A. I. Root, with his characteristic enthusiasm, took up the improvement of the manufacture of foundation, which in its crude form had demonstrated its value to the beekeeper. He employed a man named A. Washburn to develop metal rollers with the proper impressions. Although Washburn actually did the work, he was working under Root’s direction, at Root’s expense, and it was Root who took the risk of failure. In the March, 1876, issue of Gleanings, the announcement is made under date of February 26, “we are happy to state that the metal rollers are a complete success. ” The impressions were cut out by hand with metal punches. This idea of the metal rollers solved at once the problem of making foundation. Apparently, other workers had thought only of making it on a flat surface in some kind of press. In a letter from Wagner, published in Gleanings in 1876, he indicates that he was using a hexagonal type from which he made stereotype or electrotype plates on which the foundation was impressed. Wagner found his cast foundation very fragile and experimented with paper as a base with the idea that, with a wax covering, it would serve the purpose more successfully. Never has the idea that a paper center foundation would be ideal been permitted to die. Even yet, at frequent intervals, the thing is revived by someone who thinks he has made a new discovery. Wagner reported in the American Bee Journal, in 1867, that light and beautiful foundation could be made of gutta percha but that it soon became so friable that the material could not be used. One among the very few who make bee-keeping their sole business is Dr. C. C. Miller. of Marengo. Ill. He was born June 10, 1831. at Ligonier. Pa. With a spirit of independence. and a good deal of self-denial sometimes bordering upon hardship. young Miller worked his way through school. graduating at Union College. Schenectady. N. Y.. at the age of 22. Unlike many boys who go through college self-supported. running into debt at the end of their course, our young friend graduated with a surplus of some seventy odd dollars. over and above his current expenses at school; but. as we shall presently see. it. was at the expense of an otherwise strong constitution. He did not know then, as he does now. the importance of observing the laws of health. Inst cad of taking rest he immediately took a course in medicine. graduating from the University of Michigan at the age of 25. After settling down to practice, poor health. he says, coupled with a nervous anxiety as to his fitness for the position. drove him from the field in a year. He then clerked, traveled , and taught. He had a natural talent for music, which by hard study he so developed that he is now one of the finest musicians in the country. If you will refer to the preface to Root’s Curriculum for the Piano (a work. by the way. which is possessed or known in almost every household where music is appreciated), you will see that this same Dr. Miller rendered “much and important aid ” to the author in his work. In this he wrote much of the lingering; and before the Curriculum was given to the printers for the last time. Mr. Root submitted the revised proofs to the doctor for final correction. His musical compositions are simple and delightful. and you would be surprised to learn that one or two of the songs which are somewhat known were composed by Dr. Miller. Speaking of two songs composed by friend M . especially to be sung at a beekeepers convention. Dr. Geo. F. Root. than whom no one now living is better able to Judge. said. “They are characteristic and good.” Dr. Miller also spent about a year as music agent, helping to get up the first Cincinnati Musical Festival in 1873, under Theodore Thomas. Dr. M. is a fine singer. and delights all who hear him. Upon hearing and knowing of his almost exceptional talents for music. we are unavoidably led to wonder why he should now devote his attention solely to bee-keeping; and this wonder is increased when we learn that he has had salaries offered by music-publishing houses which would dazzle the eyes of most of us. But he says he prefers God‘s pure air. good health. and a good appetite. accompanied with a smaller income among the bees. to a larger salary indoors with attendant poor health. As has been the case with a good many others. the doctor’s first acquaintance with bees was through his wife, who. in 1861, secured a runaway swarm in a sugar-barrel. A natural hobbyist, he at once became interested in bees. As he studied and worked with them he gradually grew into a bee-keeper, against the advice and wishes of his friends. In 1878 he made beekeeping his sole business. He now keeps from 200 to 400 colonies. in four out-apiaries. All the colonies are run for comb honey, and his annual products run up into the tons. He is intensely practical. and an enthusiast on all that pertains to his chosen pursuit. As a writer he is conversational. terse. and right to the point. Not infrequently his style betrays here and there glimmerings of fun, which he seems, in consequence of his Jolly good nature, unable to suppress. His “Year Among the Bees”, his large correspondence for the bee-journals, and his biographical sketches preceding this, as also his writings elsewhere in this work. are all characteristic of his style. Share Birthday Wishes for Charles Dadant ! Mr. Charles Dadant was born May 22, 1817, at Vaux-Sous-Aubigny, in the golden hills of Burgundy, France. After his education in the College of Langres, he went into the mercantile business in that city, but ill-success induced him to remove to America. He settled in Hamilton, Illinois, in 1863, and found a profitable occupation in bee-culture, which in his hands yielded marvelous results. He soon became noted as one of the leading apiarists of the world. After a few years of trial he made a trip to Italy, in 1873, to import the bees of that country to America. Though at first unsuccessful, he persisted in his efforts and finally achieved great success. He was the first to lay down rules for the safe transportation of queen bees across the sea, which is now a matter of daily occurrence. Later on, in partnership with his son C. P. Dadant, he undertook the manufacture of comb foundation which has been continued by the firm, together with the management of several large apiaries, run almost exclusively for the production of extracted honey. Although well versed in the English language which he had mastered at the age of forty-six, with the help of a pocket dictionary, Mr. Dadant was never able to speak it fluently and many of the readers of his numerous writings were astonished when meeting him to find that he could converse with difficulty. His writings were not confined to American publications, for in 1870 he began writing for European bee-journals and continued to do so until his methods were adopted, especially in Switzerland, France and Italy, where the hive which he recommended is now known under his name. For twenty years he was a regular contributor to the Revue Internationale D’Api-culture, and the result has been that there is probably not another bee-writer whose name is so thoroughly known, the world over. Mr. Dadant has been made an honorary member of more than twenty bee-keepers associations throughout the world and his death which occurred July 16, 1902, was lamented by every bee publication on both continents. Mr. Dadant was a congenial man, and a philosopher. He retained his cheerfulness of spirit to his last day. In addition to his supervision of the revision of this book, he was the author of a small treatise of bees, “Petit Cours d’ Apiculture Pratique.” He also published in connection with his son a pamphlet on “Extracted honey,” Revised into the French Language was also undertaken by their united effort. This book has since been translated into the Russian language. Source: Langstroth on the Hive and the Honey Bee, Eighth Ed., Edited, Enlarged and Completed by Chas. Dadant and Son, 1905. World Bee Day became World Bee Day after a successful campaign by the country of Slovenia (Anton Janša’s birthplace) to promulgate the message. Their petition to the United Nations was accepted in December 2017, so this year marks the first official World Bee Day. I’ve been following (and promoting World Bee Day) ever since I heard the effort was underway a couple of years ago, so below you’ll see some of my earlier posts. Stephen Taber III. (17 April 1924 – 22 May 2008) was an American apiologist, noted authority and author in the field of artificial insemination of queen bees for the purpose of developing disease resistant and gentle bee colonies. Mr. Stephen Taber III, was a world-recognized honey bee researcher. He was born on April 17, 1924, to Dr. Stephen Taber II and Bessie Ray Taber of Columbia, S.C. His father was the South Carolina State Geologist from 1912 to 1947 and the head of the Department of Geology at the University of South Carolina, where he was involved in the engineering of the Santee Cooper Dam among many other projects. Steve became interested in bees at an early age, using the banks of the Broad River in Columbia as his research yard. Steve’s first commercial beekeeping experience was in 1941 in upstate New York where he worked one summer making $30 a month. He continued working in NY and later Wisconsin where he claimed to have learned much of the basics of beekeeping. He graduated from University High School in Columbia, SC in 1942 and enlisted in the U.S. Navy as an Aviation Cadet in October that same year. While serving in the Navy, he taught beekeeping as a sideline job at several local universities. Steve was later honorably discharged from the Navy in September 1945 after the end of World War II. After the Navy, Steve attended the University of Wisconsin. In 1950, he graduated from the University of WI in Madison, with a Bachelor of Science, specializing in Bee Research under the tutelage of Professor C.L. Farrar. His first position was with the Entomology Research Division of USDA as an assistant to Dr. O. Mackenson in Baton Rouge, La. This is where he met his longtime friend Murray S. Blum. It was during this time that Steve pioneered the use of instrumental (artificial) insemination, undertaking some of the first seminal and biochemical investigations carried out with invertebrate spermatozoa. After 15 years in Baton Rouge, he was transferred to the USDA Bee Research Center in Tucson, Arizona, where, in his words, “I was my own instructor.” Steve traveled extensively teaching, lecturing, and researching. Some of his students are leaders in the world of beekeeping research today. His book, Breeding Super Bees, will attest to some of his research and his studies around the world. His articles and research publications are still being referenced by honey bee researchers worldwide. Articles written by Steve, and his collaborative efforts with others, appeared in numerous publications for more than 50 years. They include American Bee Journal, Gleanings in Bee Culture, Journal of Economic Entomology, Journal of Apicultural Research and Beekeepers Quarterly. “The life and legacy of Steve Taber is one that will remain in the hearts of those who knew him. His knowledge and mannerisms have molded the lives of all those he touched. He will never be forgotten. Taber, Steve; Howard G. Spangler (1970). “Defensive Behavior of Honey Bees Towards Ants”. Psyche. 77 (2): 184–189. doi:10.1155/1970/49131. Taber III, Stephen (1980). “Bee Behavior“. Beekeeping in the United States Agriculture Handbook. 335. Taber, Steve (1987). Breeding Super Bees . Ohio: A.I.Root Co.
Moses Quinby is known as the “Father of Commercial Beekeeping in the United States,” Among his innovations in beekeeping, he is credited with the invention of the modern bee smoker with bellows. He is also the author of the book Mysteries of Bee-Keeping Explained (1853). At his peak, he kept over 1200 hives of bees. Moses Quinby was born April 16, 1810, in Westchester Co.,N. Y. While a boy he went to Greene Co., and in 1853 from thence to St. Johnsville, Montgomery Co., N. Y., where he remained till the time of his death, May 27, 1875. Mr. Quinby was reared among Quakers, and from his earliest years was ever the same cordial, straightforward, and earnest person. He had no special advantages in the way of obtaining an education, but he was an original thinker, and of that investigating turn of mind which is always sure to educate itself, even without books or schools. When about twenty years old he secured for the first time, as his own individual possession, sufficient capital to invest In a stock of bees, and no doubt felt enthusiastic in looking forward hopefully to a good run of “luck” in the way of swarms, so that he could soon “take up” some by the aid of the brimstone-pit. But “killing the goose that laid the golden egg” did not commend itself to his better judgment, and he was not slow to adopt the better way of placing boxes on the top of the hive, with holes for the ascent of the bees, and these boxes be improved by substituting glass for wood in the sides, thus making a long stride in the matter of the appearance of the marketable product. With little outside help, but with plenty of unexplored territory, his investigating mind had plenty of scope for operation, and he made a diligent study of bees and their habits. All the books he could obtain were earnestly studied, and everything taught therein carefully tested. The many crudities and inaccuracies contained in them were sifted out as chaff, and after 17 years’ practical experience in handling and studying the bees themselves as well as the books, he was not merely a bee-keeper but a bee-master; and with that philanthropic character which made him always willing to impart to others, he decided to give them, at the expense of a few hours’ reading, what had cost him years to obtain, and in 1853 the first edition of Mysteries of Beekeeping Explained made its appearance. Thoroughly practical in character and vigorous in style, it at once won its way to popularity. From the year 1853, excepting the interest he took in his fruits and his trout-pond, his attention was wholly given to bees, and he was owner or half-owner of from 600 to 1200 colonies, raising large crops of honey. On the advent of the movable frame and Italian bees, they were at once adopted by him, and in 1862 he reduced the number of his colonies, and turned his attention more particularly to rearing and selling his Italian bees and queens. In 1865 he published a revised edition of his book, giving therein the added experience of 12 years. He wrote much for agricultural and other papers, his writings being always of the same sensible and practical character. The Northeastern Bee-keepers’ Association, a body whose deliberations have always been of importance, owed its origin to Mr. Quinby, who was for years its honored president—perhaps it is better to say its honoring president, for it was no little honor, even to so important a society, to have such a man as president. In 1871 Mr. Quinby was president of the N. A. B. K. A. It Is not at all impossible that the fact that so many intelligent beekeepers are found in New York is largely due to there being such a man as Mr.Quinby in their midst. The high reverence in which he was always held by the bee-keepers, particularly those who knew him best, says much, not only for the bee-master, but for the man. “His life has been in every sense a life of usefulness and not wholly devoted to the interests of bee culture, for he took it living interest in any movement he thought would benefit society : and as an advocate and helper in the temperance work he did no mean service. He possessed true kindness of heart, and regarded it as a religious duty to make all better and happier with whom he came in contact, and regarded that life a failure that did not leave the world the better for having lived. Gilbert M. Doolittle (1846-1918) was a 19th-century apiarist and author considered to be the father of commercial queen rearing. His book Scientific Queen-Rearing: As Practically Applied (Thomas G. Newman: Chicago, 1888) was reissued over several editions. Doolittle also wrote ​​several brochures on beekeeping, and submitted regular articles to Gleanings in Bee Culture over many years. His involvement coincided with a great expansion of beekeeping knowledge in the United States. Scientific Queen-Rearing: As Practically Applied pp. 169. Chicago: Newman & Son (1889). Description of the Hive I Use, and My Management of Bees pp. 15. Chicago: Newman & Son (1900). Management of Out-Apiaries pp. 36. (4th ed.) Medina, Ohio: A. I. Root (1913). Happy Birthday Harry H. Laidlaw, Jr.
Bee biologist Harry Hyde Laidlaw Jr. (1907-2003), known as “the father of honey bee genetics,” served on the UC Davis Department of Entomology faculty from 1947 until his retirement in 1974. Long after his retirement, however, the professor continued his research and outreach programs, publishing his last scientific paper at age 87 and his last book at 90. He died at age 96 at his home in Davis. Born April 12, 1907 in Houston, Harry spent his boyhood and teen years in the Southeast: Virginia, Florida and Louisiana. In his childhood, he developed a keen interest in bee breeding and worked with his grandfather, Charles Quinn. They experimented with mating queen bees and control breeding and developed what became known as the Quinn-Laidlaw hand-mating method. In 1929, while working in Baton Rouge, Laidlaw was encouraged by his boss to attend Louisiana State University. He completed his master’s degree in entomology in 1934 from Louisiana State University and received his doctorate in genetics and entomology form the University of Wisconsin in 1939. Two years later he was inducted into the U.S. Army, commissioned. and served as the Army entomologist for the First Service Command in Boston. There he met Ruth Collins, whom he married in 1946. They lived in New York City where he worked as a civilian entomologist for the Army. His career with the UC Davis Department of Entomology began in 1947. Laidlaw is best known for developing artificial insemination technology for honey bees. His contributions enabled selective breeding of honey bees and pioneered the fundamental study of insect genetics. He authored numerous scientific publications and four books on honey bee genetics and breeding. Laidlaw received national and international awards for his research and service to the university, agriculture and the beekeeping industry. He was elected a fellow of the American Association for the Advancement of Science in 1955, and the Entomological Society of America (ESA) in 1991. At UC Davis, he was the first associate dean for research (1969) in the College of Agricultural and Environmental Sciences. The College of Ag selected him for its Award of Distinction in 1997. 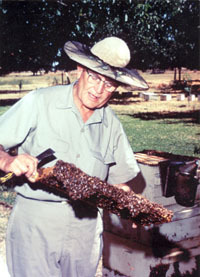 Laidlaw was awarded the Western Apiculture Society’s “Outstanding Service to Beekeeping” award in 1980, being cited as “one of the great scientists in American agriculture.” In 1981 he won the C.W. Woodworth Award of the Pacific Branch of the ESA. Although retired, in 1980-85, he established a honey bee breeding program for the Egyptian Ministry of Agriculture as part of a joint UC-Egypt agricultural development program. In 2001, the Bee Biology Laboratory at UC Davis was renamed the Harry H. Laidlaw Jr. Honey Bee Research Facility. Local artist and sculptor Donna Billick and entomologist-artist Diane Ullman designed the sign at the facility. Biographical materials, correspondence, writings, research materials, course materials, printed materials, memorabilia, photographs. The modern round plastic section appeared in 1954. It was called “Cobana” and seems to have been designed by a Pennsylvanian beekeeper named Dr. Wladyslaw Zbikowski, a retired physician. Abbe Warré developed the popular hive based on his experience with 350 hives of different systems existing at the time as well as on the natural behaviors of the bee . In order to disseminate his works, he wrote several books: Health or the Best Treatments of All Diseases , Honey, Its Properties and Uses , Health, Guidebook for the Sick and Well- Being and especially the Most Important ‘Beekeeping for all’ , a new edition was published by Coyote in 2005. The previous edition was published in 1948. Its goal was to obtain a hive closest to the natural conditions of the bee, while being practical for the beekeeper. He preferred to make savings rather than profits and was looking for savings instead of productivity. His hive was thus based on a small financial investment for its manufacture and its exploitation. He hoped that everyone could have a hive and harvest honey without having to equip themselves with many tools of extraction. Happy Birthday William Woodley born at Oxford on March 9, 1846. Thirty years ago Mr Woodley had become famous as a bee-keeper. He specialised in sections with great success, and for years carried off the best prizes at the biggest shows. He was no jealous guarder of secrets, but for many years by his contributions to the “Bee-Keepers’ Record,” the “Berkshire Bee-Keeper;” to this journal, and occasionally to the American bee-keeping magazines he placed the advantage of his knowledge and great experience at the disposal of those who were seeking success in bee culture. Until the last he was a reader of current American bee literature, but his habit of thought saved him from the error of imagining that methods and practices that suit America are equally suitable for this country, with its different climate and flora. Years ago Mr Woodley worked over 200 stocks, and did a large business in honey and in supplying swarms of bees, many going to Scotland, where they were worked for the heather. Acarine disease robbed him of the whole of his stock, but he had began to work it up again, without any intentions, however, of going so extensively as formerly into the business. Mr Woodley was led by his cousin to take an interest in bees. Mr A. D. Woodley’s father promised him a hive of bees, but for some time he did not accept the offer. An article in “Chambers’s Journal” which he read in 1879, and the subsequent possession of Cheshire’s “Practical Bee-Keeping,” published about that time, filled him with enthusiasm. He accepted the offer, and got his father during the Easter holidays to help him make a frame hive, into which he transferred the combs and bees. He persuaded Mr Woodley to take an interest in the bees his great-aunt kept at Beedon, and at Whitsuntide of the same year went over to Beedon and made him his first hive. This hive Mr Woodley called “Jumbo,” and it is in existence today. Mr Woodley secured some most beautiful honey in bell glasses, which were exceedingly popular in his novitiate days, and the products of his bees were soon on the show bench at the Crystal palace and elsewhere. Until disease swept away his stock Mr Woodley had been a regular exhibitor at the Royal Agricultural Show. Read the full article originally written in the Obituary British Bee Journal – 25 October 1923 at: Beehive Yourself. There you will also be able to further explore the life and works of Mr. William Woodley. Worked as a Apicultural Assistant with the USDA Bureau of Entomology. Wrote many pamphlets and books on honey bees. Commercial comb-honey production / by Geo. S. Demuth. Five hundred answers to bee questions pertaining to their behavior and relation to honey production. The preparation of bees for outdoor wintering / E.F. Phillips and George S. Demuth. September 18 is the birthdate of British-American entomologist Charles Valentine Riley. Riley pioneered the scientific study of insect pests and their impact on agriculture. He founded the US Department of Agriculture’s Division of Entomology and was one of the first to use biological pest control. Oh, he saved the French wine industry, too. He had an unlikely start. C.V. Riley (as he was usually known) was born in Chelsea, the yuppie section of 19th-century London. His father was a minister, a rising star in the Church of England. At age 11, C.V. was sent to the continent (France, then Germany) to study languages, art, and science. But within a couple of years, his father died and C.V. was brought back to London. His widowed Mum remarried and C.V. was disinherited. By 17, C.V. Riley was on his way to America to work as a farm labourer on property owned by a British investor who had taken an interest in the young man’s plight. After a few years of grueling farm work, Riley found a job as a reporter and artist for a farm journal, Prairie Farmer. It was 1864 – Riley was 20, drafted into the American Civil War, and released after his compulsory 100 days of service. Riley then went back to the magazine, continuing as an artist and reporter, but taking on the added job of editor of the journal’s bug division. The boy from Chelsea was the Prairie Farmer’s entomology editor. Dr. Thomas D. Seeley is the Horace White Professor in Biology at Cornell University. He is based in the Department of Neurobiology and Behavior, where he teaches courses on animal behavior and does research on the behavior and social life of honey bees. His work is summarized in three books: Honeybee Ecology (1985), The Wisdom of the Hive (1995), and Honeybee Democracy (2010). He teaches biology and performs research at Cornell University. Ormond Aebi (1916 – July 2004) was an American beekeeper who was reported to have set the world’s record for honey obtained from a single hive in one year, 1974, when 404 pounds of honey were harvested, breaking an unofficial 80-year-old record of 303 pounds held by A. I. Root. Together with his father Harry, the Aebi’s wrote two books on beekeeping: The Art and Adventure of Beekeeping (1975) and Mastering the Art of Beekeeping (1979) (both currently out-of-print). Ormond told me a curious story that day though, which I’ll retell just as he told it to me. Ormond was a character with very strong beliefs, beliefs that I don’t happen to share, but he was earnest and sincere and his beliefs do make for a good story. So here it is. He said that Jesus came to him in a dream one night and told him that if he wanted to increase the productivity of his hives that he should attach a wire to the queen excluders of his hives. Jesus was very specific about the length of the wire and Ormond carefully complied with Jesus’ instructions. For those who don’t know, the queen excluder is a series of parallel wires placed closely together in a bee hive. It sits between the lower brood boxes and the upper supers, the boxes where the honey is stored. It functions to keep the queen from laying eggs in the boxes that contain the honey in them. She’s too big to fit between the wires, but the worker bees can still come and go unimpeded. So Ormond attaches the precisely measured wires to the queen excluders and waits. Sure enough, just as Jesus promised in the dream, the productivity of the hives increases significantly. Ormond is a religious man, and so he doesn’t think it is too surprising that Jesus’ advice worked. He mentions his experience to his beekeeping friends, and word eventually reaches the biology department of Stanford University. Stanford University finds it surprising, very surprising. They come to his home in Santa Cruz to investigate. In his later years he was diagnosed with Diabetes, which did not seem to affect his health, but did contribute to his decision not to continue beekeeping when his swarms were destroyed by varroa mites. He worked as a part-time handyman at a daycare next door to his home for the last several years of his life, and continued to write to friends he made worldwide due to his books.